The Destructive Power of Family Wealth offers thoughtful, holistic planning to ensure that your wealth remains a positive force for your family. While today's families have become global and the world has become smaller and more mobile, we have not yet become immune to the problems wealth poses to the family unit. This book provides authoritative guidance on family wealth management, with an emphasis on both family and wealth. Global taxation regimes, changing bank secrecy laws, asset protection and other critical issues are examined in depth to assist wealth owners in planning, and the discussion includes details on the essential tools that aid in the execution of any wealth management strategy. More than a simple financial planning guide, this book also delves into the psychology of wealth, and the effect it has on different family members; wealth destroys families every day, and smart management means maintaining the health of the family as much as it means maintaining and expanding wealth. Family wealth brings advantages, but it also carries a potential for destruction. Wealth owners have a responsibility to their families and to themselves, and this book provides the critical guidance you need to get it right, whether you are part of a wealth-owning family or are an advisor to wealth-owning families. Families at all levels of wealth are vulnerable to shifting economic climates, evolving regulatory issues, asset threats and more. Any amount of wealth is enough to shatter a family, but deeply intentional planning based on thoughtful consideration is the key to keeping destructive forces at bay. The Destructive Power of Family Wealth provides expert guidance and a fresh perspective to help you maintain both family and wealth. 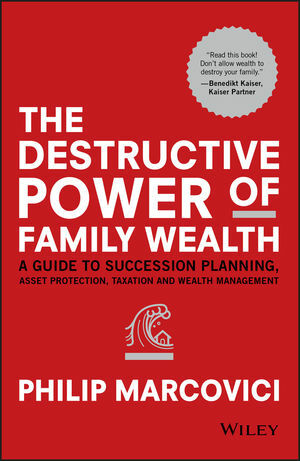 For those in the wealth management industry and for other advisors to wealth-owning families, The Destructive Power of Family Wealth contains insight on the needs of today's wealth-owning families, ways in which the tools of wealth planning address those needs and guidance on what it takes to be a successful, trusted family advisor. PHILIP MARCOVICI is actively involved in education and strategy across the legal and tax spectrum. He has extensive experience advising multinationals, financial institutions and families on the international and domestic aspects of Canadian, Hong Kong and U.S. taxation, as well as on commercial issues relevant to cross-border transactions. He advises clients on issues related to the use of trusts and insurance products and continues to work with governments and international agencies on strategy and treaty negotiations. Among others, a recipient of the Lifetime Achievement Award from the Society of Trust and Estate Practitioners, he teaches widely and is an adjunct faculty member at the Singapore Management University.